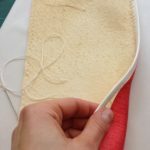 In October 2017 I attended a three-day workshop organised by the ICON Book and Paper group at the British Library in London, to make a model of a 12th century English limp tawed skin binding. 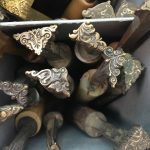 The course was given by Jim Bloxam ACR, Head of Conservation and Collection Care at Cambridge University Library, and Shaun Thompson, Collection Care Manager at Cambridge University Library. 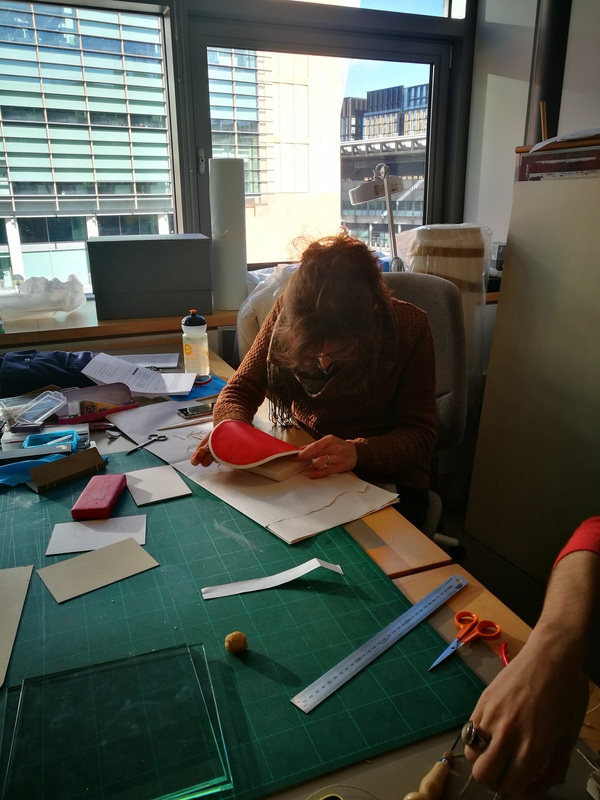 The course focused on the recreation of Manuscript Pembroke 119 (Alain de Lille, Anticlaudianus) from the Cambridge University Library. 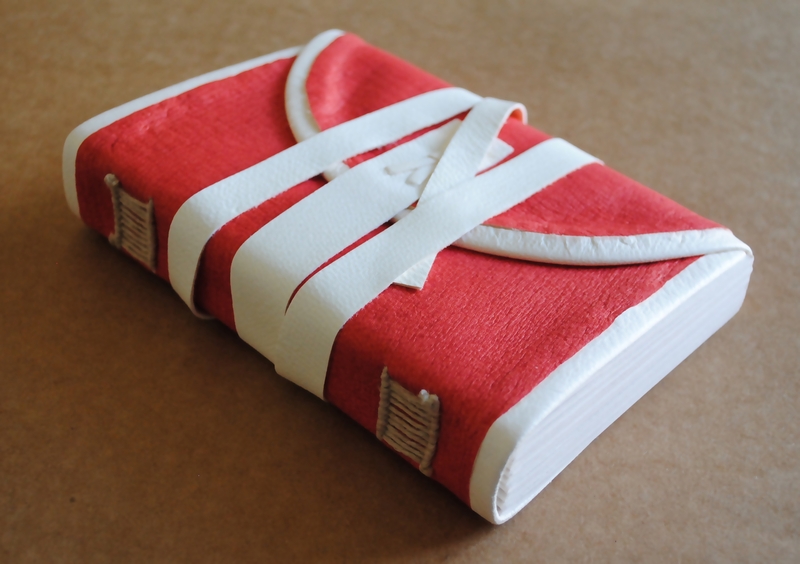 The book, still in its contemporary binding, is covered with a limp alum-tawed skin, stained in red. 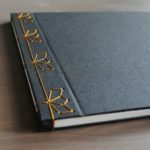 Not a lot of information is available about this particular manuscript, its origin or location, nor about its peculiar sewing structure, which will be explained further in this blog. Made by craftsmen, its complexity proves it is not a temporary form. 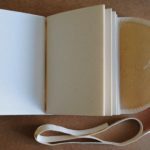 Functional, durable, light, flexible and portable, the limp binding form suggests the book was made for private and regular use. 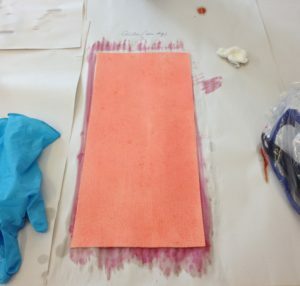 The course started with the staining of our alum-tawed skin. 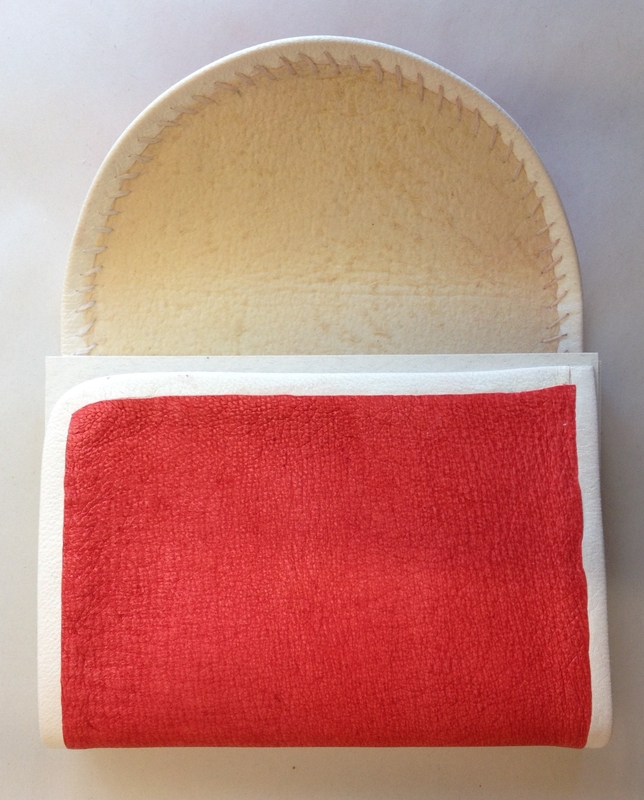 Tawing is a skin process which involves the immersion of the skin in alum salt (potash) at 20-30°C. 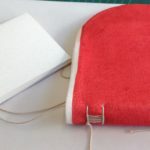 Egg yolk is added to increase the suppleness of the materials. 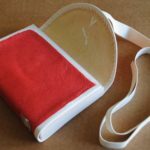 The result is resistant to dyeing, but can be easily stained with organic dyes. 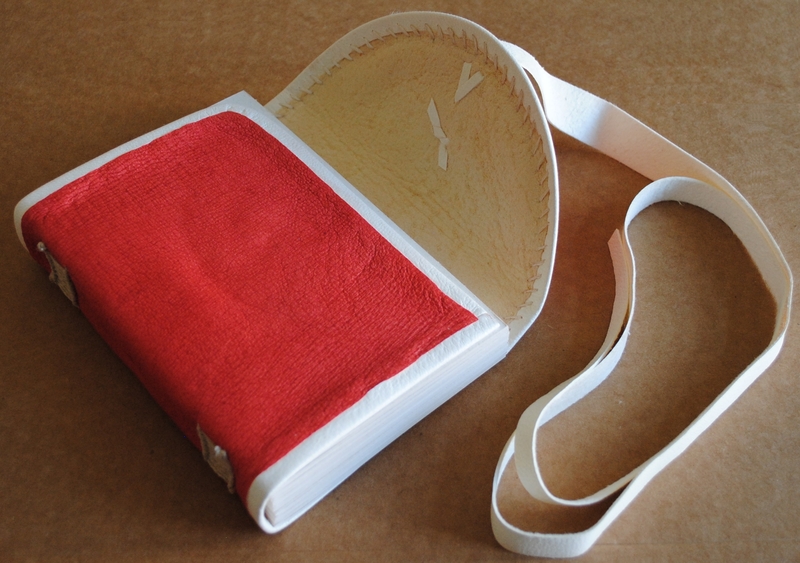 In this case, we used a Brazil wood dye, which was available in the 12th century. Our recipe included alum, lime water (prepared using burnt ashes) and Brazilwood. 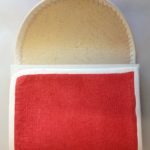 Lime water acts as a fixative, providing more durability to the dye. 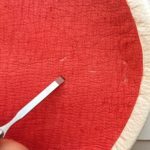 Red staining with Brazilwood dye. 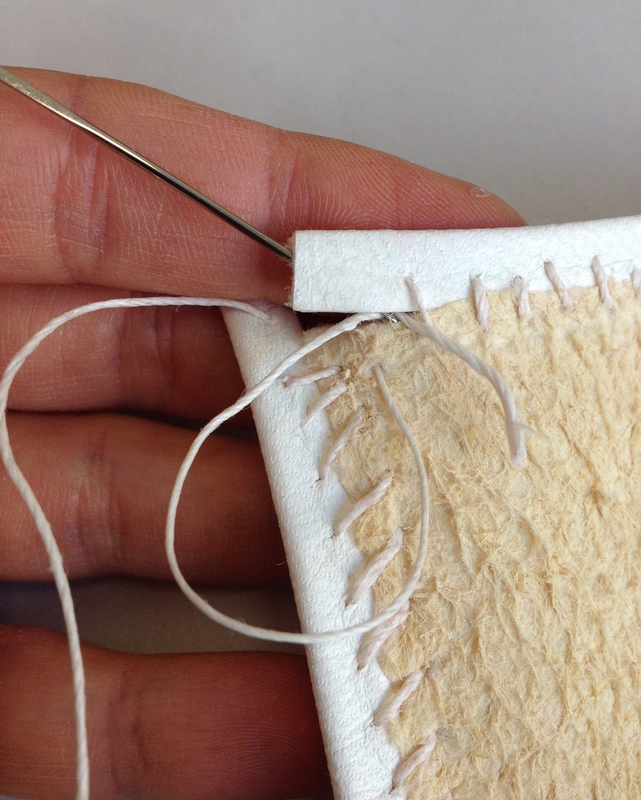 The skin was then edged-fleshed sewn with a separate piece of plain alum-tawed skin. 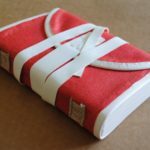 This “invisible” sewing technique is not recorded in bookbinding manuals, but information is found in shoe making literature. 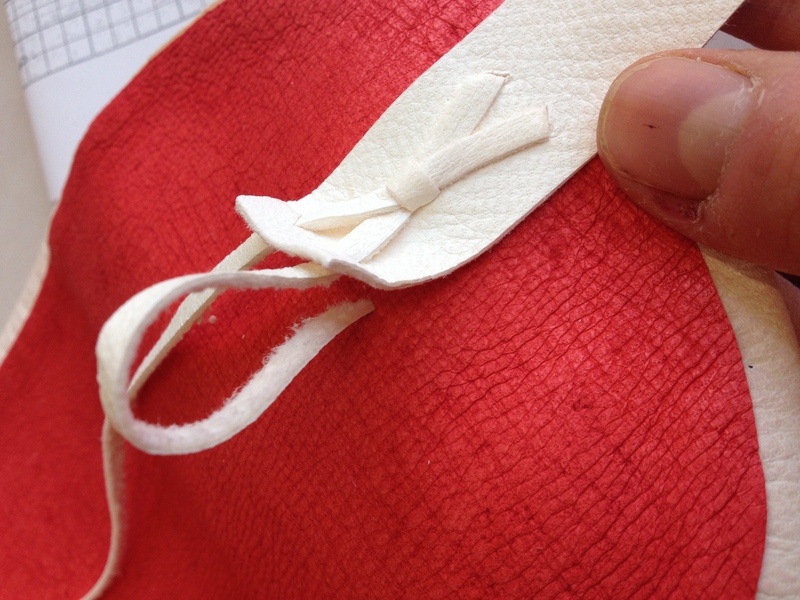 The sewing is only visible from the inner part of the cover, hence its name. The sewing is a whipped stitch sewing, and was also used for repairs. 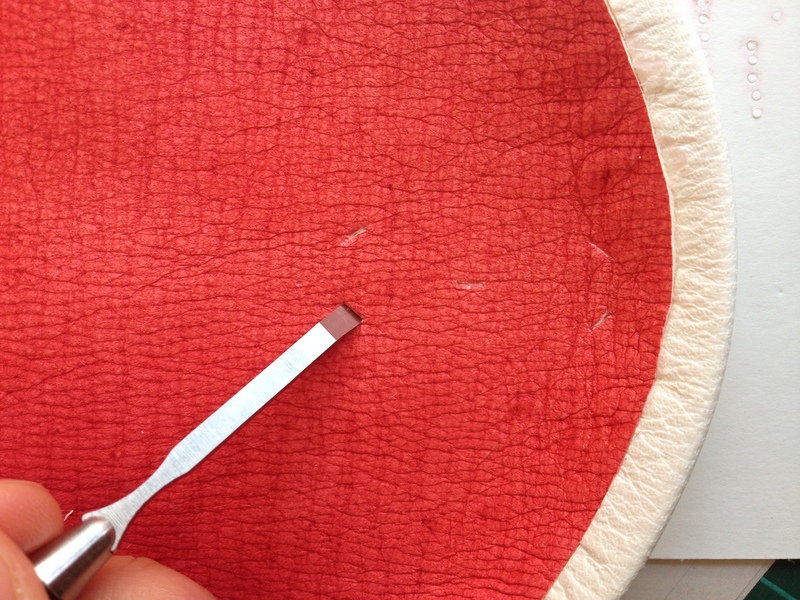 Pre-piercing the skin in preparation for the edge-flesh sewing. 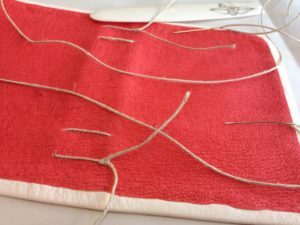 Edge-flesh sewing in progress – detail. 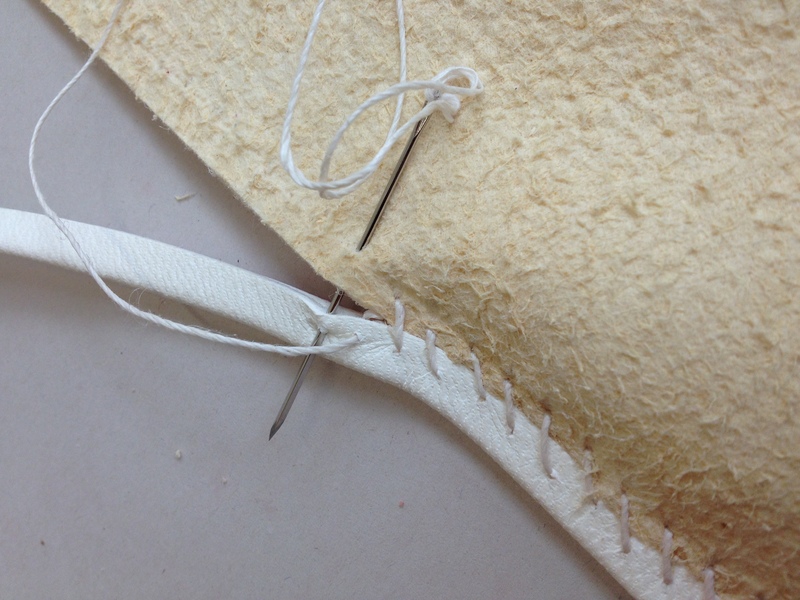 Edge-flesh sewing in progress – view of the front and back. 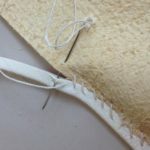 The text block was then attached to the pre-pierced cover, using a link-stitch pattern around “integral” sewing supports. 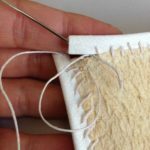 The sewing loops around two pairs of vertical lengths of thread, created as a first step when starting the sewing. 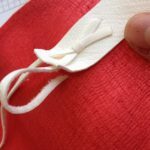 Creating the “integral” sewing supports when starting the sewing. 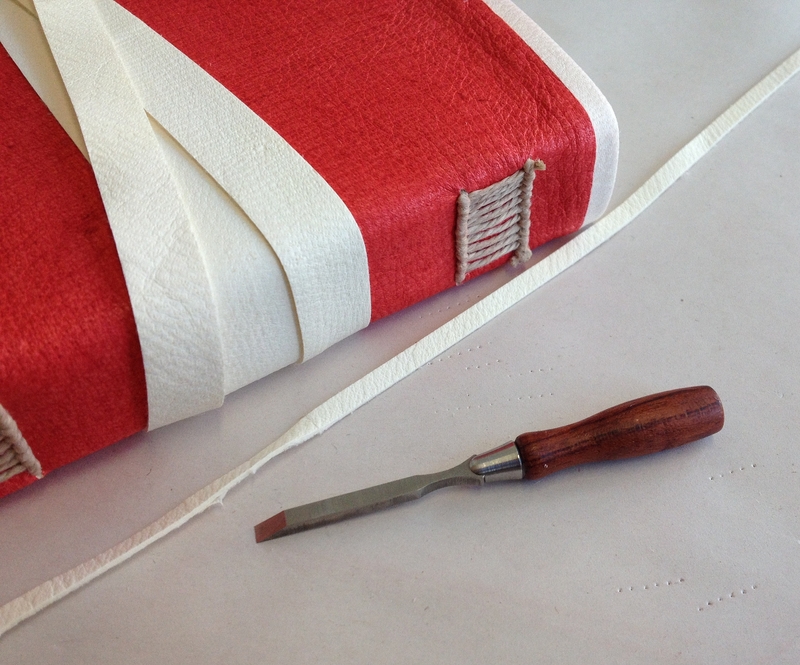 The sewing attaching the text block to the cover followed a particular structure, looping around the “integral” supports, creating a pattern similar to a “ladder”. 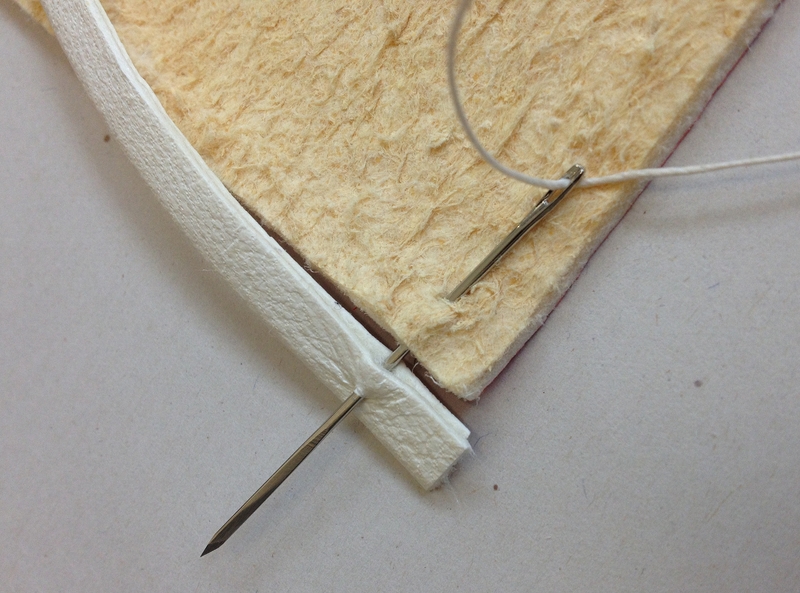 Creation of the integral sewing support prior to sewing the text block. 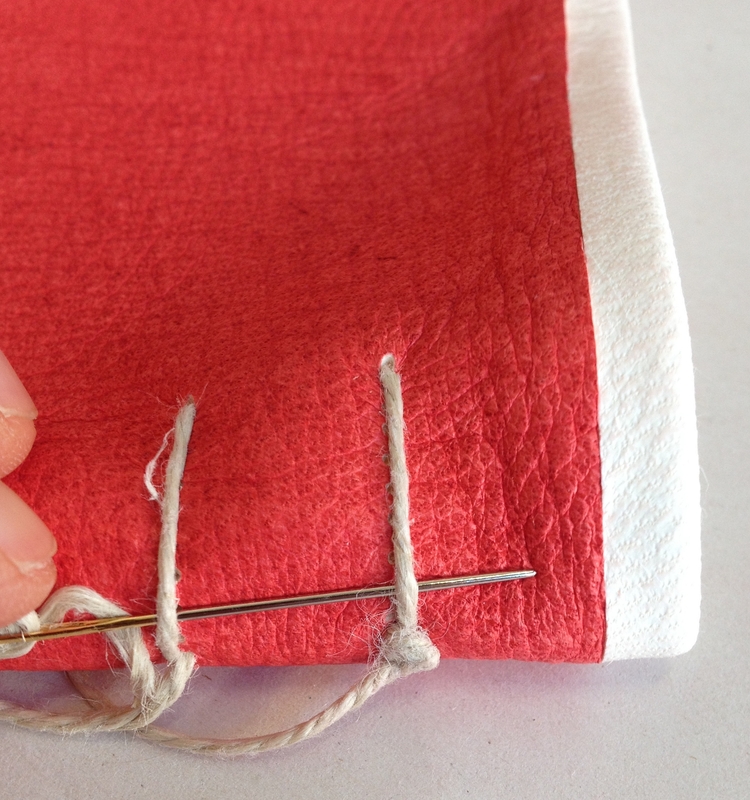 Link-stitch sewing in progress, creating a “ladder” pattern. So much concentration needed! Copyright: Shaun Thompson. 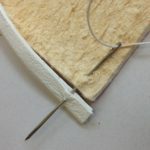 The alum-tawed wrapping band was finally cut and attached to the cover flap with a thin alum-tawed strip, allowing the text block to stay under the necessary pressure. 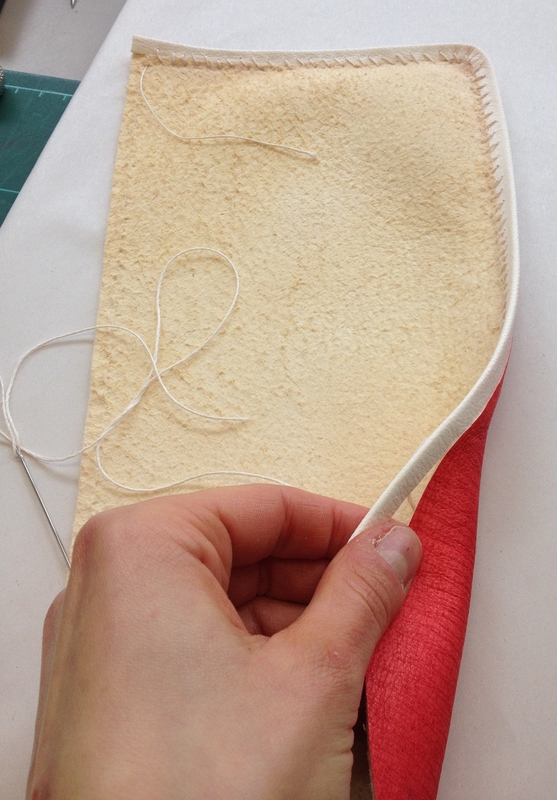 Preparation of the wrapping band attachment to the alum-tawed skin cover. 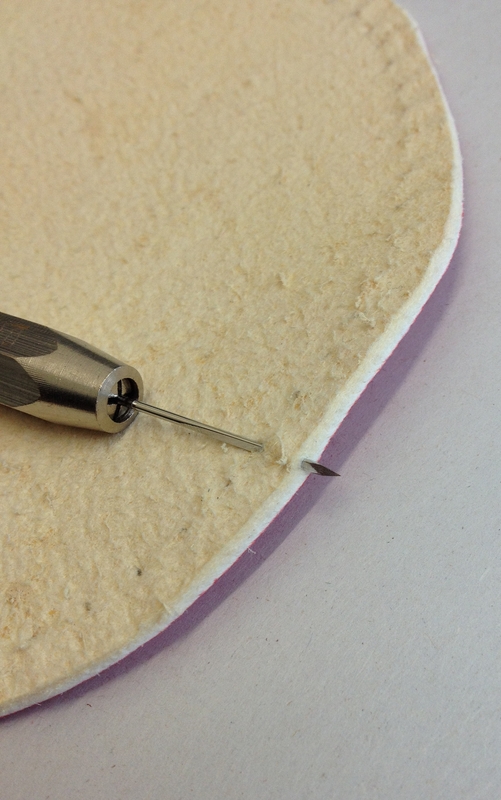 Pre-piercing in preparation for the wrapping band attachment. 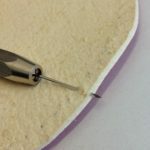 Attaching the alum-tawed wrapping band. 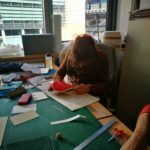 This workshop was a great opportunity to study a unique Romanesque limp binding structure, its materials and historical context,with knowledgeable and skilled tutors. 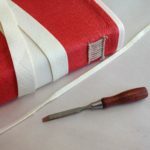 I also learned a lot of new bookbinding tricks and tips, met new professional, and discovered new tools (yes, I had tool envy!). 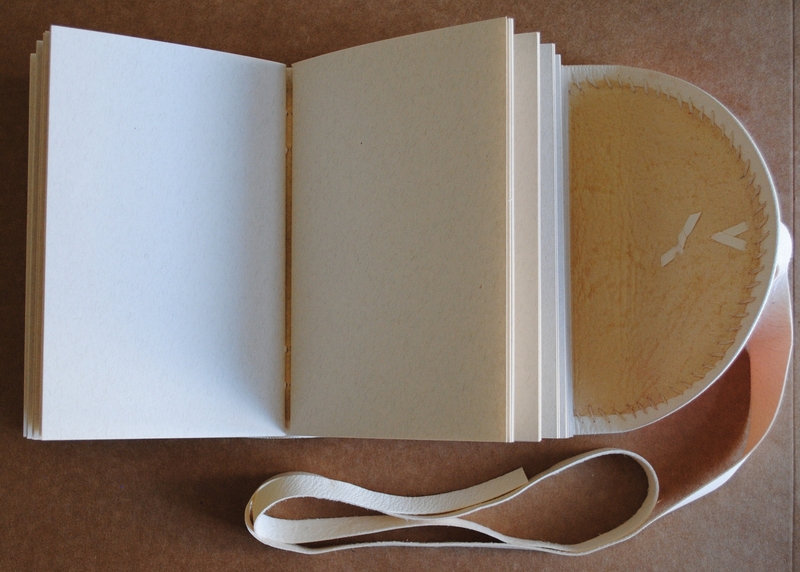 Can’t wait to start bookbinding again!